Description: •Your best choice ro remove dirt, grease, rubber carpet backing, industrial residues, or epoxy coaings from a horizontal surface. The DFG Series Floor Grinders are also suited for grinding and polishing concrete, asphalt, terrazzo, and marble floors. Description: •Your new choice when you need a machine to remove stains, deposits, corrosion, or coatings from a horizontal surface. 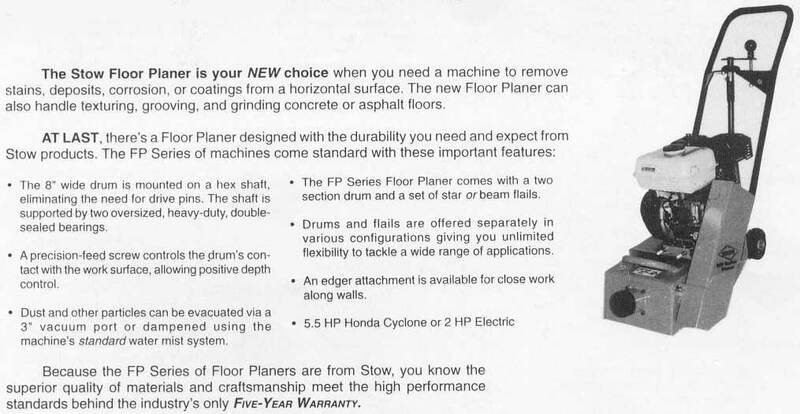 The new Floor Planer can also handle texturing, grooving, and grinding concrete or asphalt floors. Description: •Your only choice when you need a machine rugged enough to withstand the mechanical stress of random crack sawing. The center mounted blade design allows superior pivot control and work-surface visibility, while Heavy-Duty sealed swivel casters provide smooth travel. Description: True to the innovative tradition of Mr. Nelson Stow, who transformed a buggy whip into the flexible power transmitter, thus reforming trades from sheep shearing to scissor sharpening, today Stow Manufacturing Company offers you the Carb-Edge Scraper System. It is guaranteed to transform your frustration with the expensive or inadequate methods of other floor coating removal systems into elation with our method of peeling paint, epoxy, glue, rubber ... nearly any floor coating known to man. The Carb-Edge System utilizes two carbide inserts (each with eight usable edges) mounted on an axled block. The carbide edges scrape the surface and literally peel coatings from the concrete. Six blocks are required per machine and are available individually or as a kit. Description: The broad-tipped Beam Flail is well suited for the most common planing applications: coarse texturing and milling. In addition, the Beam Flails remove tile and carpet adhesives, paint, dirt deposits, and are excellent for traffice and parking lot line removal. 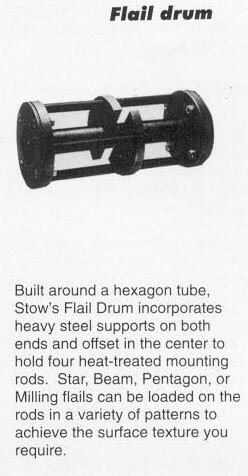 Description: Built around a hexagon tube, Stow's Flail Drum incorporates heve steel supports on both ends and offset in the center to hold four heat-treated mounting rods. Star, Beam, Pentagon, or Milling flails can be loaded on the rods in a variety of patterns to achieve the surface texture you require. Description: Made for grinding and finishing concrete, asphalt, terrazzo, and natural tone surfaces, Grinding Stones are blocks of silicon carbide grit. The blocks are graded by grit size with the low numbers being coarse and high numbers being fine. 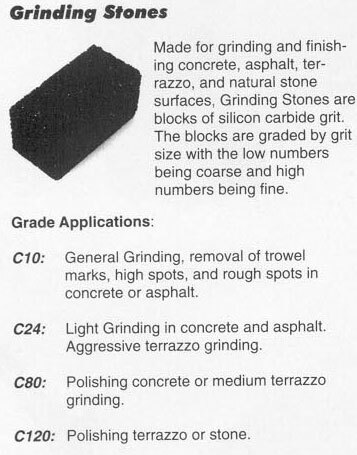 C10: General Grinding, removal of trowel marks, high spots and rough spots in concrete or asphalt. C24: Light Grinding in concrete and asphalt. Aggressive terrazzo grinding. C80: Polishing concrete or medium terrazzo grinding. 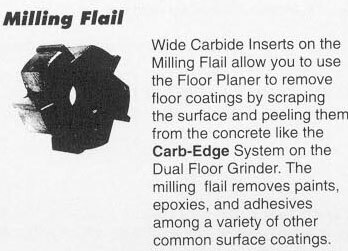 Description: Wide Carbide Inserts on the Milling Flail allow you to use the Floor Planer to remove floor coatings by scraping the surface and peeling them from the concrete like the Carb-Edge System on the Dual Floor Grinder. The milling flail removes paints, eposies, and adhesives among a variety of other common surface coatings. Description: Carbide tips give the Pentagon Flail a capacity for long life and high production in coarse textruring and aggressive milling applications. 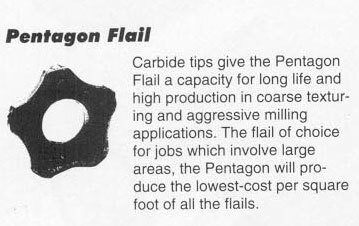 The flail of choice for jobs which involve large areas, the Pentagon will produce the lowest-cost per square foot of all the flails. Description: By mounting our Star, Beam or Pentagon Flails on a dual axle steel block, we can offer a scarifier system tailored to your needs. 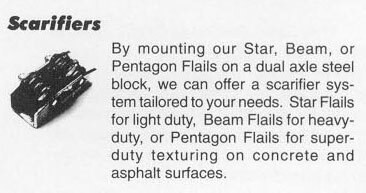 Star Flails for light duty, Beam Flails for heavyduty, or Pentagon Flails for superduty texturing on concrete and asphalt surfaces. Description: The fine-tippend Star Flail is ideal for creating light textured surfaces and removing thin coatings or rust. Made from heat-treated steel, the Star Flail is most effective in light, shallow (1/16") applications. Description: For Aggressive grinding and exceptionally long life, choose our Tungsten Carbide Blocks. Featuring a matrix impregnated with tungsten carbide beads, you expect twice the removal rate and up to ten times the life of ordinary grinding stones. 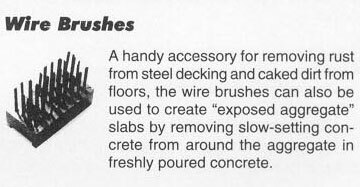 Description: A handy accessory for removing rust from steel decking and caked dirt from floors, the wre brushes can be also be used to create "exposed aggregate" slabs by removing slow-setting concrete from around the aggregate in freshly poured concrete.